Between 1924 and 1930 Henderson created 12 portraits of Northern Blackfoot, Piegan, Blood, Stoney, Sioux and CreeThe largest group of First Nations in Canada, and part of the Algonquian language family. See the Canadian Encyclopedia for more information: http://www.thecanadianencyclopedia.com/index.cfm?PgNm=TCE&Params=A1ARTA0002005 First NationsFirst Nations is a contemporary term referring to the Indian peoples of Canada, both status and non-status (definition from Indian and Northern Affairs Canada). 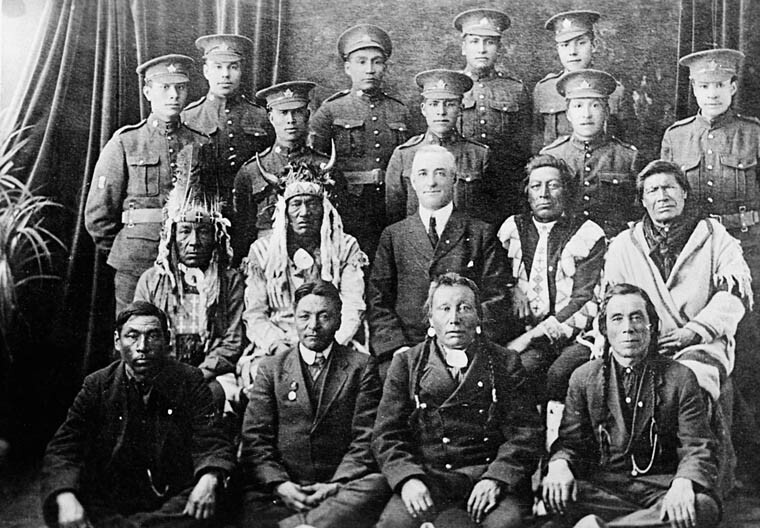 To find out more about Canada’s First Nations, go to: Assembly of First Nations: http://www.afn.ca/ Village of First Nations: http://www.firstnations.com/ Canada’s First Nations: http://www.ucalgary.ca/applied_history/tutor/firstnations/ Wikipedia: http://en.wikipedia.org/wiki/First_Nations leaders. The University of Saskatchewan originally commissionedA contract between an artist and an individual. The artist agrees to create an image or design for the individual for a predetermined price. the portraits, although it appears other collectors purchased many of them after they were completed. Chaski, for example, was painted in 1925 and eventually was donated to the Mendel Art Gallery by the daughter of Walter Murray, who was President of the University of Saskatchewan in the 1920s. Sun Walking - Blackfoot was painted later, in 1945. Henderson did not just paint portraits of First NationsFirst Nations is a contemporary term referring to the Indian peoples of Canada, both status and non-status (definition from Indian and Northern Affairs Canada). To find out more about Canada’s First Nations, go to: Assembly of First Nations: http://www.afn.ca/ Village of First Nations: http://www.firstnations.com/ Canada’s First Nations: http://www.ucalgary.ca/applied_history/tutor/firstnations/ Wikipedia: http://en.wikipedia.org/wiki/First_Nations people. Instead, he made a serious study of the character of the people, spending much time with them on their reserves. 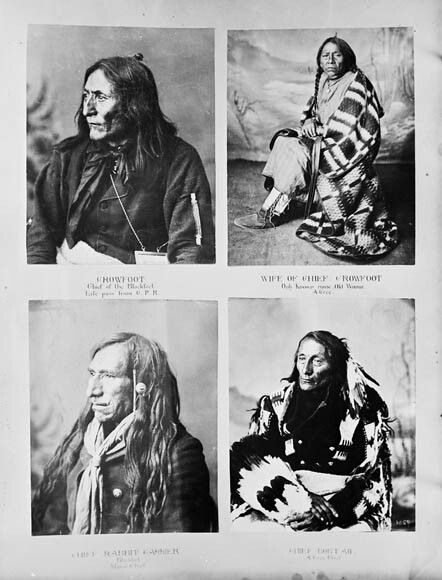 As is mentioned in the About the artist section on Henderson, the people of the Standing Buffalo First Nation near Henderson's home responded to his respectful interest by naming Henderson an honourary chief. The two portraits presented within the ARTSask Recorders and Keepers theme – Sun Walking and Chaski – are from the Mendel Art Gallery collection. They illustrate Henderson’s traditional approach to portraitA work of art that represents a specific person, a group of people, or an animal. Portraits usually show what a person looks like as well as revealing something about the subject's personality. Portraits can be made of any sculptural material or in any two-dimensional medium. Portraiture is the field of portrait making and portraits in general. Portrait is a term that may also refer simply to a vertically-oriented rectangle, just as a horizontally-oriented one may be said to be oriented the landscape way. (Artlex.com) painting. Whether you interpret the mood and presence of the men portrayed as comtemplative, defiant, proud, melancholy or wistful, there is an inherent dignity that Henderson has captured in his portraits. Some works by James Henderson at Hodgins Art Auctions Ltd. The two portraits presented here are part of a long traditionTradition is the passing along of a culture from generation to generation, especially orally. Or, a custom or set of customs handed down in this way. The idea of heritage is related to that of tradition. Any activity — as a pattern of celebration, ritual, or other behaviour, etc. — is traditional once it is a precedent influencing comparable activities in the future. (Artlex.com) of portraitA work of art that represents a specific person, a group of people, or an animal. Portraits usually show what a person looks like as well as revealing something about the subject's personality. Portraits can be made of any sculptural material or in any two-dimensional medium. Portraiture is the field of portrait making and portraits in general. Portrait is a term that may also refer simply to a vertically-oriented rectangle, just as a horizontally-oriented one may be said to be oriented the landscape way. (Artlex.com) painting. They are of interest both because of Henderson’s paintingWorks of art made with paint on a surface. Often the surface, also called a support, is either a tightly stretched piece of canvas or a panel. How the ground (on which paint is applied) is prepared on the support depends greatly on the type of paint to be used. Paintings are usually intended to be placed in frames, and exhibited on walls, but there have been plenty of exceptions. Also, the act of painting, which may involve a wide range of techniques and materials, along with the artist's other concerns which effect the content of a work. (Artlex.com) skill and also for their contribution to western Canadian history. However, recent critical assessments have judged them to be more important as historical records than for their artistry. Do your think it is more difficult to judge the merits of a work of art when it also has historical significance? The people of Standing Buffalo First Nation chose to name Henderson “the man who paints the old men” – meaning he paints the Elders. What do you think might be the significance of giving Henderson this name? Henderson painted these portraits at a time when the subjects could have been photographed. (In fact, there are many thousands of photos of First NationsFirst Nations is a contemporary term referring to the Indian peoples of Canada, both status and non-status (definition from Indian and Northern Affairs Canada). To find out more about Canada’s First Nations, go to: Assembly of First Nations: http://www.afn.ca/ Village of First Nations: http://www.firstnations.com/ Canada’s First Nations: http://www.ucalgary.ca/applied_history/tutor/firstnations/ Wikipedia: http://en.wikipedia.org/wiki/First_Nations people. The excellent book by Brock V. Silversides, The Face Pullers, documents some of these photos). Why might it be important to also document people in paintings or drawings? Match the picture frame style to the image and personality depicted. To do this, click on and drag the images into the frames you think match! Choose the person on whom the work will be based. It can be someone who is close to you, a historical figure, or someone who is in the news. In a journal record your thoughts, research, and inquires about that person’s life and personality. You may look at pictures and read through historical documents, or you may take pictures and conduct interviews depending on who your subjectA topic or idea represented in an art work. is. Think about the qualities that make this person special. Paint a portrait of your hero on paper. Use a combination of the studies you made, photographs, your own memory, and descriptions to create the portrait. The portrait should be a frontalThe head-on view of a person or object. (Artlex.com) view of the head/face including the shoulders. When you have finished, cut out the portrait. Next assemble a wooden frameSomething made to enclose a picture or a mirror; or an enclosure composed of parts and joined together; or to make such things. (Artlex.com) (see example here). Note that the width of the frameSomething made to enclose a picture or a mirror; or an enclosure composed of parts and joined together; or to make such things. (Artlex.com) should match the shoulder span of the painted portrait. The frameSomething made to enclose a picture or a mirror; or an enclosure composed of parts and joined together; or to make such things. (Artlex.com) should be a minimum of three inches in depth so that it can stand. (This frameSomething made to enclose a picture or a mirror; or an enclosure composed of parts and joined together; or to make such things. (Artlex.com) will stand upright with the portraitA work of art that represents a specific person, a group of people, or an animal. Portraits usually show what a person looks like as well as revealing something about the subject's personality. Portraits can be made of any sculptural material or in any two-dimensional medium. Portraiture is the field of portrait making and portraits in general. Portrait is a term that may also refer simply to a vertically-oriented rectangle, just as a horizontally-oriented one may be said to be oriented the landscape way. (Artlex.com) attached to the top.) You can have the wood precut at a lumber or home building supplies store if needed. Glue or staple a paper or cardboard backing to the wood frame. Paint the frameSomething made to enclose a picture or a mirror; or an enclosure composed of parts and joined together; or to make such things. (Artlex.com) and backing a colourProduced by light of various wavelengths, and when light strikes an object and reflects back to the eyes. Colour is an element of art with three properties: (1) hue or tint, the colour name, e.g., red, yellow, blue, etc. : (2) intensity, the purity and strength of a colour, e.g., bright red or dull red; and (3) value, the lightness or darkness of a colour. When the spectrum is organized as a color wheel, the colours are divided into groups called primary, secondary and intermediate (or tertiary) colours; analogous and complementary, and also as warm and cool colours. Colours can be objectively described as saturated, clear, cool, warm, deep, subdued, grayed, tawny, mat, glossy, monochrome, multicolored, particolored, variegated, or polychromed. Some words used to describe colours are more subjective (subject to personal opinion or taste), such as: exciting, sweet, saccharine, brash, garish, ugly, beautiful, cute, fashionable, pretty, and sublime. Sometimes people speak of colours when they are actually refering to pigments, what they are made of (various natural or synthetic substances), their relative permanence, etc. (Artlex.com) that you associate with your hero. Fill the wood frame with an selection of hand-made and collected objects that reflect this person’s life and personality. For example, if the person you choose is your grandmother think about what she does and who she is. Is she a gardener? If so, you might place handmade or artificial flowers, or seeds from her garden in the frame. Does she like to play games or cards? If so, you could add games pieces or cards to represent this. Does she like music or play an instrument? If so, you could add a miniature instruments or use sheet music. Think about objects that might represent or symbolize your hero’s achievements like tools, medals, and awards; again these can be made or foundAn image, material, or object, not originally intended as a work of art, that is obtained, selected, and exhibited by an artist, often without being altered in any way. The cubists, dadaists, and surrealists originated the use of found images / materials / objects. Although it can be either a natural or manufactured image / material / object, the term readymade refers only to those which were manufactured. Also known in the French, objet trouvé. (Artlex.com) objects. Attach all these objects to the inside, the backing, the sides, and the outside front of the wood frame. Overlap the objects so that they look layered. You might think of the layering as a timeline of sorts. To finish, attach the portraitA work of art that represents a specific person, a group of people, or an animal. Portraits usually show what a person looks like as well as revealing something about the subject's personality. Portraits can be made of any sculptural material or in any two-dimensional medium. Portraiture is the field of portrait making and portraits in general. Portrait is a term that may also refer simply to a vertically-oriented rectangle, just as a horizontally-oriented one may be said to be oriented the landscape way. (Artlex.com) by gluing or stapling it to top of the frame. The wood frameSomething made to enclose a picture or a mirror; or an enclosure composed of parts and joined together; or to make such things. (Artlex.com) should be directly under the shoulders of the portrait. Stand the piece upright for viewing. When your mixed mediaAny material and technique used to produce a work of art (paint, glass, clay, fibre, video, sound, etc.). It may also refer to the liquid with which powdered pigments are mixed to make paint. Note that the plural form of “medium” is “media.” sculptureA three-dimensional work of art, or the art of making it. Such works may be carved, modeled, constructed, or cast. Sculptures can also be described as assemblage, in the round, and relief, and made in a huge variety of media. A sculptor is one who creates sculptures. (artlex.com) is complete display it and share stories and information about the person you represented. Author unknown. ‘Famous Artist Passes Away.’ Fort Qu’Appelle Times, July 19, 1951. Author unknown. James Henderson 1871-1951. Exhibition catalogue. Mendel Art Gallery, Saskatoon, Saskatchewan, 1969. Belton, Robert J. Sights of Resistance: Approaches to Canadian Visual Culture. Calgary, Alberta: University of Calgary Press, 2001.
Colgate, William. Canadian Art: Its Origin and Development. Toronto, Ontario: Ryerson Press, 1943. Francis, R. Douglas. Images of the West: Responses to the Canadian Prairies. Saskatoon, Saskatchewan: Western Producer Prairie Books, 1989. Hayworth, Arthur. ‘James Henderson of the Qu’Appelle Valley.’ Saskatchewan History, Spring, 1958. Newman, Marketa, ed. Biographical Dictionary of Saskatchewan Artists, Men Artists. Saskatoon, Saskatchewan: Fifth House Publishers, 1994. Silversides, Brock V. The Face Pullers. Fifth House Publishers, Saskatoon, 1994.